Our service rate is $75.00 an hour for on-site and shipped repairs Shipping charges will be added to any shipped date stamp to be repaired. Service on Rapidprint, Widmer and Acroprint. Most date stamp service is completed within one hour. 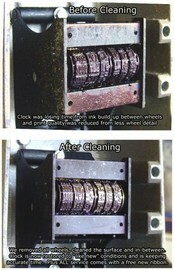 Parts are additional and the customer will be contacted with a quote before any part, other than ribbons, are replaced. Shipping Based Service: Service is also provided by shipping your date stamp to us. Turn-around time is typically done within 48 hours. The customer will be notified if longer periods are required.